IT was a very hot day. A farmer was working on his field. He was there for several hours. He was very tired and wanted to get some rest. Just before he found a nice place to rest, he saw something very shiny. He came to the shiny object and took it. It was a hedgehog statue. It was very beautiful. Its eyes were made of diamond. Those were the shiny objects he saw. The farmer then brought the statue home. He wanted to show it to his wife. His wife was so happy. They were so poor and planned to sell the statue. The farmer told his wife about his dream. They really wanted to prove it. The farmer slowly caressed the statue's head. He said the prayer and asked for rice. Suddenly, a magical thing happened. Rice came out of the mouth of the statue. The rice kept on coming out from the statue's mouth. The farmer immediately said the prayer to stop it. It worked! The rice then stopped coming out from the statue's mouth. Now the farmer mentioned other things, they were jewelry and other stuffs they needed. In just a moment, the farmer and his wife became very rich. They then shared their materials with the neighbors. There was one neighbor who was very jealous. He was actually a thief! He wanted to know how the poor farmers became rich. After the thief found out, he stole the magic hedgehog statue. He immediately took it and ran away. He was very tired from running and was very thirsty. He wanted to get some water from the statue. He said the prayer. His wish came true. Water came out of the statue’s mouth. The thief was so happy. He drank and drank the water. He wanted to stop drinking but he did not know how to stop the water. He forgot how to stop the prayer request. Water kept on coming out. He did not know what to do. He was really panicking. He asked for help. People who saw the incident were really scared. They ran away to avoid the water. More and more water surrounded him. 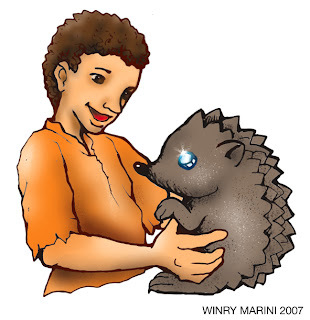 Belum ada komentar untuk "A Farmer and a Hedgehog Statue"